Our good friends somejerk (Pattern Awareness / Digital Felon) and Methodus (Rubik Records) teamed up for another awesome mix… this time for the crew at SmileForCamera.com. “In the past year or so since our first mix, the form and function of the music has changed so much, it almost didn’t seem to fair to not do a new and updated version of the mix” says Methodus, and so they have released this second mix, which offers an updated insight into the evolution of their sound. Methodus’ slightly more traditional dubstep sound is the perfect follow to somejerk’s half of the mix, which kicks things off with a set of “garagey grimey breaks” that he has become known for. Both of these cats can be found playing a number of gigs around Florida and the continental US, including the next upcoming One Movement show, featuring the massive Von D, on February 26 at Loft 168 in Miami. This is St. Augustine’s first real dubstep event! A night not to be missed, SP (of Subliminal Messages Radio) and DJ Natural (of Classic Blends) will bring the emerging dubstep sound to the nation’s oldest city. Teaming up on 4 (yes, 4!) turntables, SP and Natural will bring together dubstep, hip-hop, turntablism, and their combined experience of over 30 years behind the decks, to make sure St. Augustine truly knows what dubstep music is. 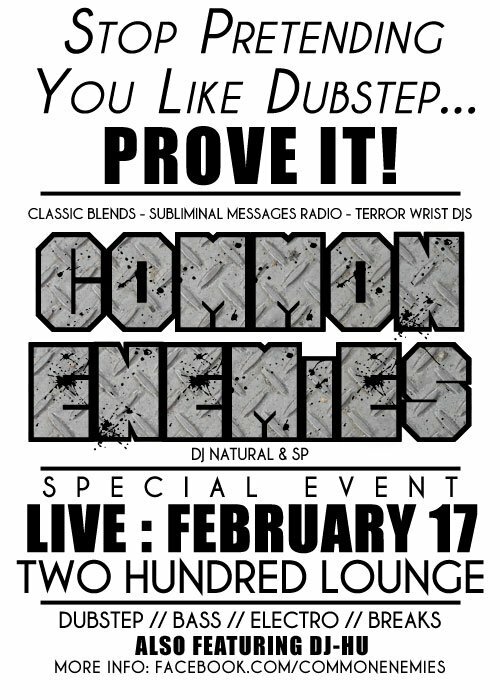 The event is sponsored by Classic Blends and Subliminal Messages Radio, and will take place at Two Hundred Lounge – St. Augustine’s newest and most popular venue – on February 17. 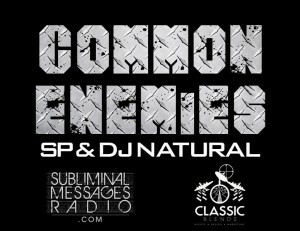 For more information on the Common Enemies project, visit them on Facebook. More info on Two Hundred Lounge can be found on their website. Broadcast live on WFCF on January 20, 2011. Treasure Fingers – What Am I Supposed To Do? Part 2 of the “Biggest Tunes of 2010″ show. Broadcast live on WFCF on January 6, 2011. Part 1 of the “Biggest Tunes of 2010” show. Broadcast live on WFCF on December 30, 2010. Welcome to the NEW SubliminalMessagesRadio.com! Archives will be posted here, along with (hopefully) some additional news and info about the show, the extended Subliminal Messages Radio family, and other random things we feel like sharing. If you’re looking for older archives, we’ve left that page on the “old website” intact – just click here, and download away!